Skywatcher 12.5mm Double Crosshair Illuminated Reticle Eyepiece 1.25"
A high quality double crosshair 12.5mm super plossl eyepiece. 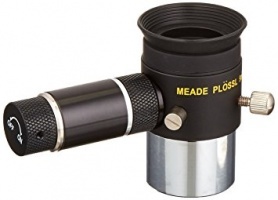 This eyepiece is ideal for manual guiding and also drift alignment. Due to the double crosshair you get a central box to keep your guide star/image in the center of your field. Celestron CrossAim 12.5mm Illuminated Reticle Eyepiece 1.25"
Reticle eyepieces are ideal for aligning goto telescopes on alignment stars in addition to being useful for guiding accurately during long exposure astro imaging. The CrossAaim reticle has an adjustable brightness red illuminator in order tp preserve your dark adapted night vision and has fully coated optics for maximum light transmission. 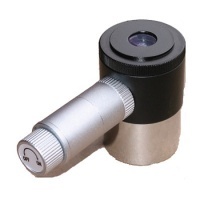 25mm measuring & guiding eyepiece, illuminated, with universal T-2 thread. Directly attaches onto each telescope with T-2 (M42x0,75) thread. Series 4000 Plössl 9mm Illuminated Reticle Eyepiece: The most advanced commercially-available illuminated reticle eyepiece, this Series 4000 Plössl 9mm model includes micrometric x-y positioning controls which greatly facilitate locking onto the guide star. Rother Valley Optics have put together a simple, but effective low cost guide package. This small lightweight system, includes a Skywatcher 50mm finderscope, a finderscope adaptor to C thread on the back, then an Altair Astro monochrome guide camera. SmartGuider SG 2, including Imaging Control System - the future in high performance astrophotography.